the system will automatically subtract 8mm from the item width and height. The opening will be 8mm smaller than the item size. sits just over the item and the item cannot fall through the opening. The picture mount will then go all around ( be added to ) the opening. Adding up the exact opening + Border left-right-top-bottom. 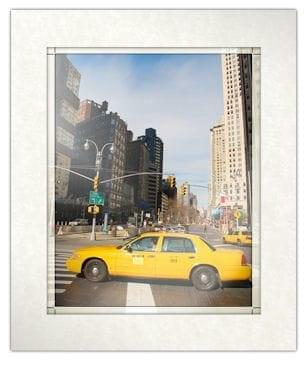 When a picture mount is ordered using Mount designer all sizes are cut exactly as you enter. 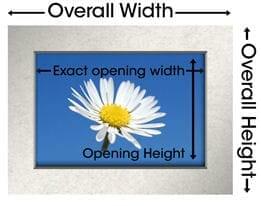 The overall size of the picture mount is worked out by adding up the exact opening + Border left-right-top-bottom. Unless you are certain of the opening you require, a good idea is to minus ( deduct ) 8mm from the size of your item so the opening when cut, sits 4mm over all around your item. The reason for this is If you have an item that is printed on paper which measures exactly 100mm x 100mm & you enter an opening to be cut into the mount of 100mm x 100mm, the item will fall through the opening !